Water is obviously important to fish, and as such, it becomes very important to aquarists. There are some basics every aquarist should know about. Cycling a tank is an essential process. The idea behind it is simplicity itself - if there's nothing in your tank to eat waste, but lots of creatures to produce it, then waste will pile up and pollute your tank. What creatures eat waste? A new tank is fairly sterile. If you set it up, fill it with water and add a full population of fish, it will be a thing of beauty. It won't take long until that changes. You may begin to find fish dead from no apparent cause. You may have epidemics of Ich, fungus or fin rot. Or your fish may develop red gills, and begin to gasp at the surface, as toxic ammonia destroys their respiratory systems. It's an avoidable problem, but one that puts a lot of aquariums into garage sales. How do we work around it? Time is your ally here, along with patience. A good start is to 'inoculate' your tank with friendly bacteria. For this, you can use gravel or plants from an established tank, or one of the commercial bacterial starter cultures on the market. Bacteria spread quickly, but not quickly enough to deal with the kind of pollution a large group of fish will produce in a tiny amount of water. The safest approach is to stock lightly, and slowly. Start with 25% of your planned population. Keep them for a week, feeding them normally. The wastes they excrete will produce toxic ammonia, a fine food for our friendly bacteria. The well-fed bacteria will spread, converting the toxin to nitrate, a less dangerous pollutant. With a program of regular water changes, you can keep the nitrates under control. As the invisible bacteria colonize your filter and aquarium, you can gradually add more fish, moving to a full population within three to four weeks. An ammonia test kit can be a useful tool during this process, especially if you have hard, alkaline water, in which ammonia is a bigger problem. Really, there isn't much you have to do to cycle your tank. Just restrain your desire to fill your aquarium with beautiful fish, for a short couple of weeks, and you can start on the process of enjoying your pets for years. In nature, the water in different regions will vary. In areas where the watertable passes through limestone or other dissolving rock, the water will be hard. Measuring hardness is problematic. If you've ever encountered difficulties due to the United States using the Imperial measurement system while the rest of the world uses Metric, consider the mess created as the system used to grade hardness varies from country to country. German degrees of hardness are different from French degrees, and so on. One thing an aquarist can do is fall back on measurement of p.p.m. (parts per million), and get hold of conversion tables for European texts. Soft water is found in areas where the water table is supplied by rain. Many cities with softwater add alkalinity and hardness, as the acidity that usually goes with softness is hard on municipal water pipes. Many urban areas have water of moderate hardness, ranging from 100ppm to 180ppm. People with wellwater will often suffer from hard water - 190 ppm to liquid rock. The pH scale is the measure of water acidity. 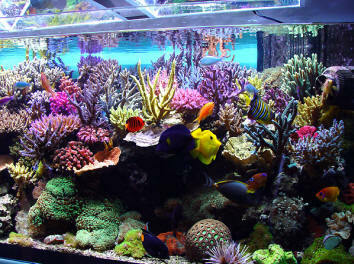 Aquarium-fish regions like the Amazon, West Africa, and parts of Asia can have very acid water, ranging from pH 3 to 6. Their water is also soft. An reading of pH 7.0 is considered neutral, and many North American cities will be in the 6.6 to 7.8 range. Central America and the cichlid-filled Great Lakes of East Africa have alkaline water, in the pH 8.0 range. We can measure pH in several ways. The most efficient is a well-calibrated electronic pH monitor, but that's an expense few aquarists want to spring for. Your aquarium store should have easy to use chemical test kits that work by providing a rough, working idea of your pH by comparing chemically treated water to color charts. Follow the instructions closely. Remember that the difference in acidity between pH 7.2 and 7.4 is rather large. Sudden pH changes can hurt or even kill your fish. The objective of chlorinating drinking water is to kill everything in it. In some areas, chlorine isn't enough, and a chemical called chloramine is added. Will these chemicals kill your fish? Sometimes. Chloramine, because it doesn't break down as quickly as chlorine, is especially dangerous to the gills of your pets. As well, city water treatments will often reduce the bacterial populations in your tank, harming the beneficial bacteria in your filter. Allowing water to sit, or aerating it vigorously with a pump and airstone will cause most of the chlorine to dissolve. Aquarium water conditioners are safe and cheap, and highly recommended. It's always better to be safe than sorry. If you live with hardwater, then the logical move is to keep African lake cichlids or livebearers. Unless you have a lot of experience, modifying your water becomes a chore. You can buy a Reverse Osmosis unit or an Ion exchange system, but like exercise bicycles, these things are easy to buy but hard to keep using. It's easy to harden softwater, but you need test kits to see that your modifications are consistent. Sometimes, it's best to study your fish, learn their needs and live with what nature has given you by choosing pets that will thrive in the conditions you can be sure to offer them.